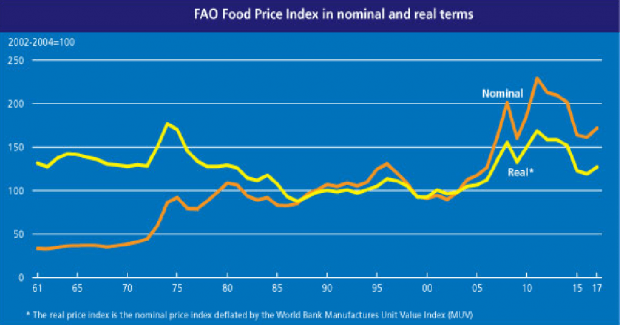 And as the UN’s own data shows, crop yields have been rising steadily since 1960. Obama himself is so concerned about global warming that he flew by private jet to Milan, in order to make this speech, which earned him $2.7 million. Not satisfied with such carbon spewing, he then took a 14 car convoy, to drive into the city. Not for him to have to share a bus with the little people! Someone just put him to sleep please. Trouble is, he isn’t just a harmless old pres’, millions will believe what he says, even thout it’s total sh**e.
In Europe there have been temporary food shortages due to bad weather but not climate change, e,g, courgettes and broccoli. I doubt whether fresh food has been so available and cheap in the UK, although I don’t know how long that will continue as long as population continues to rise and we take more land out of agriculture to build houses. I think it is possible that we will become increasingly vulnerable to shortages for various reasons, but climate change is not one of them. Cold weather is far more serious where crops are concerned. The cold recent spell in the NH has caused quite a bit of damage to Vines in Europe, Wheat & Asparagus plus Cattle killed in the US, even Brazil ha shad problems. If the planet does get colder, I am sure it will be blamed on “climate change”. quaesoveritas, of course it will be blamed on climate change, and rightly so as the climate IS changing, just not in the warming sense. It is absolutely true that “climate change,” trending towards cooler temperatures, HAS impacted agriculture, and in a direction that more carbon dioxide in the atmosphere can’t offset in any way. The whole “boiling planet” scam to reduce energy production was built on the fact that the climate is getting colder, and with less energy available, population can be reduced far more quickly through hypothermia than can ever be reduced by island populations being inundated – slowly – by a rising sea. People obviously can live in higher temperatures without A/C since they did in the past, but there is no way you can live in a drastically colder environment without energy for heat. Not to mention all of the agricultural land being wasted for solar and wind farms. … and the relentless campaign by the BBC and others for subsidies to farmers to grow less food and provide more land for wildlife habitat. I would not say “wasted”, perhaps sometimes abused. A golf course surely is more a case of wasting land, and water…. Apparently golf courses make good habitat for hedgehogs, so they are not all bad (golf courses that is). 30% of our food is imported from the EU and is going to be under threat of ceasing after Brexit because of the return of customs controls. The food industry has become as Just in Time as say the automotive industry and relies on quick shipment. That currently looks like ending come 30 March 2019. It may well be that exporting to the UK will just become not worth the effort and even now some food suppliers are looking for alternative markets for their exports. So rather than reducing the land being used for agriculture we will need to increase it. EU imposes high tariffs on Third World farmers so Brexit should see an improvement in prices that EU may not be able to match. Absolutely. Not to mention North and South American farmers queuing up for another market. We Aussies fed you once and we can do it again. Humans occupy 3% of the planets land area. Every person on the planet could have 10 square metres in the state of Texas alone. Meanwhile, the planet has greened by 14% in the last 30 years (NASA study of their own satellite data) which represents 2 continents the size of mainland USA of extra vegetation. Even without that, feeding a planet of 9Bn people isn’t considered a problem by scientists thanks to advancing technology. Assuming the planet continues to warm, billions of acres of frozen Russian and Canadian Tundra will be released to agriculture. HotScot, are you aware that at the present time, a) fresh water supplies are dwindling [some countries are already being forced to desalination],and b) non renewable natural resources are being depleted? : Such shortages will eventually result in wars. What, like Australian desalination plants that have lain virtually unused for years now? Fresh water supplies in the UK are only ‘dwindling’ because the service was privatised. Everything on the planet is in short supply when there’s profit to be made. There is precisely the same amount of fresh water on this planet, other than some space men taking a p*ss, as there was when the planet was formed. The human form, of 70% water, divided amongst 7Bn people on the planet, amounts to a bit more fresh water than a global puddle. And which, precisely, non renewable resources are being depleted? There is, of course, coal, which the UK alone has reserves extending beyond 300 years. Oil is only ‘depleted’ because the return on investment of drilling for it is not worth it, at the moment. Go and look at an oil rig on the surface of the planet, and be amazed at how small a reach it has. Meanwhile we have fracked gas reserves which have barely been touched. But you’re happy that, as fast as the natural world grows vegetation by 14%, developing nations are hacking it down for fuel, because we in the western world determine they’re not worthy of the very source of energy that dragged us from poverty. Overpopulation goes hand in hand with the global scare story designed by the Club of Rome. Read some of Dr. Tim Balls observations of their desires. To create a global scare that encourages population control in order that the elite may prosper. Sadly it’s working. And as a self confessed sceptic of everything, I looked into it, and Dr. Ball isn’t far off the mark. The club of Rome is a group of extraordinary wealthy, and well connected individuals who have deliberately spread the myth that human population is a problem. But it’s not. How can you possibly imagine that our planet can’t feed a minuscule human population when it could feed a population of dinosaurs the likely exceeded man’s entire numbers? You might like to consider the fact that the earth has never, in it’s entire existence, been as cold and as devoid of CO2 as it is right now. 100 years ago atmospheric CO2 was at 280ppm. It was 80ppm away from the point at which plant life begins to die. It was only 130ppm away from when meaningful plant life ceases to exist altogether. We have, by accident or design, gone the other way and over the last 100 years, fortunately, seen the planet generate 120ppm of atmospheric CO2. I would far rather live with the risks of that, than the certainty of the loss of 120ppm CO2. Count your observable blessings. Guessing at the future gets no one anywhere. I never believed ANY of their rhetoric and ridiculous scare stories anyway, on the simple common-sense analysis of NONE of their horrid, predictions of doom had occurred. I even think all these arguments about the pseudo science were anticipated by the scammers that wrote the whole social engineering plan: where they knew it would cause hot debate and arguments that would NEVER be agreed upon or settled. Whilst they’re all arguing and calling each other offensive names they don’t notice the huge elephant in the room – The UN’s plan to rule the world under a Socialist one-world government tyranny, but not before depopulating it by around 85%. I just can’t believe how naive the world’s supposedly educated and intelligent people have been over this blatantly obvious SCAM! It’s akin tto the 16th century inquisition. Of course this is all heresy and all ‘deniers’ such as us should be burned at the stake. 🙂 Thus the indoctrinated public (i.e. all of western society population under 45 years old) will never see stuff like this on the Soros controlled MSM. I hope Paul will allow me to post it here though. HotScott, desalination is going on in over 120 countries worldwide, generating thousands of millions of gallons of water per day. As to the depletion of natural resources, it is a matter of when, and not if, it will happen. As they become scarcer their prices will increase [as it has happened with petroleum]. It is true that most likely humans just have scratched the surface of the land in search of resources, and there are still the bottoms of the oceans to “mine”, probably resulting in a quantum jump of prices…. will accelerate the depletion of our natural resources? Note too, that as the underdeveloped countries develop, the demand for natural resources will increase accordingly. Where did you get “the fact that the earth has never, in it’s entire existence, been as cold and as devoid of CO2 as it is right now”? Do you know, and understand, that the average world population density is about 129 per mi^2, Mongolia; the least populated country, has about 5 per mi^2; and Manila, the most populated city, has about 107,560 per mi^2? Do you really think that the current “minimal” world population is being properly fed? And, how and why do you think that the dinosaurs became extinct? Do you know that the air that we inhale has about 21% O2 and 0.04% CO2, and as we exhale it has about 16% O2, 4% CO2 and 1% water vapor? To me. human activity can result in poisoning of the biosphere and depletion of natural resources; thus, as the population increases the poisoning, and depletion, most likely will increase proportionally. This is my main reason for stating that overpopulation is the worse problem that we face. Full knowledge and understanding are necessary in science, while believing, or guessing [past and or future], does not explain a thing…. To every action there is always opposed an equal reaction – Isaac Newton. Desalination in 120 countries is akin to a tear drop in the ocean. It is utterly meaningless and a solution to localised problems, likely undertaken by government subsidised, private companies profiting from local conditions. Nor are they likely to supply a whole country, just a tiny region. Quoting 120 countries’ is a hysterical overreaction. And if 1.75% of fresh water is retained in frozen glaciers, no doubt those of you overly concerned with water resources, will welcome global warming as it will release all we need from glaciers, frozen tundra etc. The depletion of natural resources? Our planet thrived with levels of CO2 of 4,000ppm before it naturally, and accidentally, sequestered all but 280ppm of atmospheric CO2 by burying virtually all plant life on earth and turning it into what we describe of fossil fuels. How incredibly coincidental was it then, that man happened on the planet, just in time to save it from extinction by burning those sequestered resources and releasing CO2 back into the atmosphere. Were I a religious man I would suggest it was divine intervention. But I’m not, so I’ll just mark it down to the most incredible coincidence the planet has ever seen. “Note too, that as the underdeveloped countries develop, the demand for natural resources will increase accordingly.” Fair enough, who am I to deny the poverty stricken the same resources the wealthy Western world has benefited from. Guess who restrictive energy policies hurt? Yep, the poor. Nor do I mean the Western poor who are incredibly privileged, compared to the real poverty stricken. But that’s OK, you continue to protect your privileged existence by denying the destitute the ability to drag themselves from starvation. I’m sure your God will forgive you. Try doing some research instead of reading wacky zealot books on fresh water. “Do you really think that the current “minimal” world population is being properly fed?” I have no idea what a ‘minimal’ world population is. However, I have lived overseas and despite the fiction you are continually fed by the mass media, most of the world is well fed and well nourished. There are of course exceptions, but mainly when there are disasters, natural, or man made, like regional conflicts. Indeed, in my experience, much of the planets population are healthier and fitter for not having your perception of Western lifestyle imposed upon them. It might, however, be a benevolent act of the West to simply allow the developing world the opportunity to cultivate the cheapest of cures to blindness, amongst genuinely destitute communities, namely, GM modified Golden Rice which has the simple genetic addition of vitamin E. Not radical, not threatening but liberating. However, Luddite’s like you stifle the simple ambition of relieving the poorest from a sense you take for granted because progress is a sin. Now, I’ll refer back to Isaac Newton’s observation and your illustration of human CO2 production. Namely, “the air that we inhale has about 21% O2 and 0.04% CO2, and as we exhale it has about 16% O2, 4% CO2 and 1% water vapor?” which is a valuable illustration as to the value of CO2 in man’s existence. However, our planet exist’s in a state of turbulent balance. Don’t you imagine for a moment that the planet understands these equations better than we humans do, and ensures a balance, somehow? Whatever you may think or imagine, our planet’s resources will be exhausted at some time, even if it is only when we plunge into the sun. Isn’t it irresponsible of humanity not to use every grain of coal, drop of oil and ounce of nuclear material to promote our existence? Again, were I a religious type, I might imagine God put us on the planet to exploit it before it was consumed. The planet will eventually be consumed, so isn’t it our duty to exploit it before moving onto another? In around 100 years we have gone from horse drawn carriages to interplanetary exploration. What can we accomplish over the next 100 years? Never mind the next 300 years before coal reserves in the UK are exhausted. Humanity exist’s on hope and ambition. Sure, we make mistakes along the way, but try to convince me your life is perfect. Most of human progress has been without science, it may have accelerated with it, but it doesn’t mean it’s the end game. In fact many would argue that science is the root cause of our social, political and spiritual problems. And whilst one might condemn religion, our devotion to science may well be, in the future, condemned as yet another cult. In fact, I would put money on it. “Desalination in 120 countries is akin to a tear drop in the ocean.” +1 The only places desalination should be used for fresh water are those that have NO fresh water resource. If so, probably a poor place for people to habitat. With proper management there’s enough fresh water on this planet ….. constantly recycled by nature …. to support many times the current population. Excellent rebuttal (to Ben) and explanation of the current global pseudo-scientific based scaremongering and evil socialist propaganda campaign. Thanks. 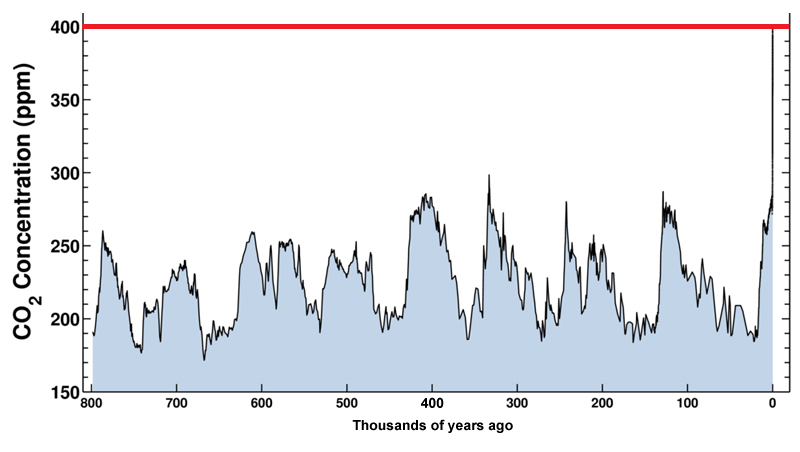 Do you see CO2 levels below 200 ppm? > According to the World Health Organization, malnutrition is the biggest contributor to child mortality, present in half of all cases. Six million children die of hunger every year. Underweight births and intrauterine growth restrictions cause 2.2 million child deaths a year. > It appears obvious that you haven’t read “wacky zealot books on fresh water”. > You mentioned “minimal” world population. > And how do you expect to gather the fresh water from melting glaciers and tundras, before it goes into the oceans or underground? > Why do you ignore the poisoning of the environment clearly caused by human activities. You have the right to express your opinions, but you have no right to express as facts of what you think, aka opine, of others. To me, this is a form of expressing lack of knowledge/understanding on the subject, or narrowmindness, or being fanatical. My mentioning the fact that we exhale about 4% CO2 is just a way of stating that CO2, up to at least up to 4%, is not toxic or pollutant. I would say that human progress is do the gradual increase of knowledge and understanding of science through judicious application of deductive reasoning; furthermore, such progress has been hampered by religious fanatics. markl, so, for crying out loud “thousands of millions of gallons of water per day” is a drop on the oceans. While the water is indeed recycled by nature, it is also poisoned/polluted by us. “to support many times the current population” sounds to me wishful thinking. the chart I posted demonstrates quite clearly, that over millions of years, there is no association between CO2 and global temperatures other than by occasional coincidence. Simply because you post some charts over a shorter time line, does that somehow change the laws of physics, or simply suit your argument? It also demonstrates, had you bothered to actually put you myopia correcting spectacles on, that short of actually descending into a full blown ice age, temperatures have never been as low as they have been, whilst CO2 has, correspondingly, and coincidentally, been as low for as long a period. It is just, quite simply, blindingly obvious from that internationally accepted piece of paleo climatological research. Why do the laws of physics suddenly change when it suits alarmists? And can you possibly comprehend the reason for all that child malnutrition? How about this. They have been, and are being deprived access to cheap fossil fuel energy to pump clean the water to drink, for sanitation and to irrigate the lands they need to produce food. They are instead stuck in sub standard housing, including mud huts, burning timber they buy from unregulated loggers chopping down tropical rain forests. Nor do I mean small villages, I mean entire cities and surrounding areas that sprawl into forests, chasing the timber. After the timber is chopped down, farmers claim the land that can only support crops for 3 years without nutrients from fertilisers derived from?……… you guessed it, factories than need reliable energy to manufacture high grade fertilisers. So the loggers cut more to feed the demand for fuel, and, by the way, create employment; the farmers move in, which generates more employment, the population need more fuel and more food, so the cycle sustains their life and the rain forest’s are destroyed. Build, even, biomass power stations, using fuel from the forest’s and logging is controlled, the city gets all the clean energy it needs, and the farmers, soil nutrients. A bonus is, of course, families aren’t dying from smoke inhalation from burning wood and dung and children get clean water and sanitation as well as food. Where did I get all this info? My late father in law was a senior forester in the UN and was pleading this case from the 1950’s, long before the greens even got their grubby paws on the idea of tropical forests. And boy did he hate those interfering green socialist idealist’s. They killed his friends and the communities he lived in for years. You might remember Maiduguri, the university city razed by Boko Haram a couple of years ago. My FIL built a doctors surgery from corrugated iron when he first went there, the first building in the place. Many of the community that worked for him are now dead, thanks to Boko Haram. Everywhere he went, he was expected to stop illegal loggers, so wrote the UN innumerable reports that the solution was to deal with the cause, not the symptom. They ignored them. Because these people are theorists. When you spend a lifetime in the Amazon, Peru, Burma and Cuba, amongst many other tropical rain forest locations during my FIL’s lifetime, I would far rather believe him than a theorist who has never cut down a tree never mind organised 300 year plans to re forest entire regions, build national timber processing plants so the farmed timber sold overseas could generate income for the communities in danger of malnutrition and dehydration. And what did Fidel do? As soon as the UN left his island paradise, he shut down the factories and sold the equipment to the highest bidders, yep……you guessed it again, the illegal loggers. And did the peasants see a brass farthing? What do you think? What in God’s name do you think happens to the frozen earth, hundreds, if not thousands of miles from the sea if temperatures rise? The ice turns to water and there are billions of acres of land, without the support of ice, which subsides and forms lakes, with water in them! What poisoning of the planet? Is CO2 a poison? What in Gods name are you on about man, you have been indoctrinated by the AGW nonsense that falls down, logically and scientifically, at every hurdle. Everything I have stated is observational or scientific fact. Nor are they my opinions, they are the opinions of at least one expert, namely my late FIL, who wrote numerous reports to support his, and his colleagues contentions. And yet submariners are subjected to CO2 at around 6,000ppm with no ill effects. We exhale around 40,000ppm, if you’re scared of the stuff, don’t let anyone talk in your presence, you might imagine you’re dead. Then you would say wrong. Human progress is down to trade. Plain and simple. You might want to read Matt Ridley’s book “The rational Optimist” before you bandy about pompous and ill considered statements like that. HotScott, Quite a diatribe. I know a bit about fanatics in that it usually is useless even trying to communicate with them, and quite frankly you have demonstrated, to me, beyond the shadow of the doubt that you appear to be one of them. Therefore, bye and have a nice day! what do you know about fanatics? You have never encountered much more of life than from beyond a keyboard. ‘Ne’er cast a clout till May be out’ meaning removing certain clothing till end of May. True I think because I have about 1% of my strawberries showing strawberry blackeye. Bit of frost a few days back and thats the end of them. Matches the hit on the grapes in the South. I’m in the W. Mids and don’t normally get this problem in May. So despite the modelling/forcasting BS the planet will still do the deed. Surprise….? A clout, or Scottish cloot, is a duster, often used mid winter to make clooty dumplings, traditional winter fare. In spring, the duster is returned to it’s normal use, of cleaning, which isn’t worthwhile until ‘May is oot’, because the weather is likely to close in again. Spring cleaning is the opportunity to open the house to fresh air to clean it of the winters coal smoke. Doing it too early meant risking doing it again; after May in Scotland, but much earlier in Southern parts of the country. I’m afraid it’s nothing to do with clothing. Lying comes naturally to these socialist politicians. They wouldn’t know how to speak truthfully. That’s why the left wing media hate Corbyn. He can’t male lunacy sound rational. Doesn’t the left wing media hate everyone? In the figure on grain prices, the sharp rises after 2006 can likely be attributed to the biofuel mandates and the removal of the MTBE legal protection a couple of years later. The potential is certainly there for lower (food crop) yields and higher (food) prices if we continue with this madness of using cereal crops as motor fuel. It beggars belief that even the scientifically illiterate and obsessive enviro-nuts could ever have thought this was a good idea on any level. Meanwhile Obama and his pals like di Caprio putter on either ignorant or heedless of the built-in hypocrisy in their behaviour. Surely sanity will prevail eventually. Surely? If you haven’t seen this, its well worth a view. The late Dr. David MacKay, a self confessed green nut, but one with a secure grasp of reality. So no change in Obama telling lies. What idiot thought he was worth paying $2.7m to in the first place? In Obama we have a lier, that lies. No news here. BO’s speeches are even more expensive than the Clintons’, another first! When you have a Saul Alinsky follower, this is what you should expect. They lie. Marx gives them permission and Alinsky codifies it. And Marxist hypocrisy permits you to do all the things you say other people shouldn’t. THE MESSIAH (Barack Obama) – a blatant liar and raging hypocrite. The “Science Says So”. He does nto âlieâ he says what he is told and what firs into Dem. Energy policy… be careful Paul! His sources have not changed – fake news. Keep repeating the lies long enough and the people start believing them. Plus about 6 motorbikes and at least one helicopter. Has anyone told the Italians he’s not the POTUS any more? To me, former POTUS is a classical case of a politician being duped to “believe” in a scientific topic without having sufficient knowledge and understanding of the subject matter. It is noted that believing does not explain a thing in science.